Wash and peel the lauki/bottle gourd and grate it. Squeeze the grated lauki by pressing it between both of your palms and discard the juice or collect the juice and use it in curry. Mix grated lauki,gram flour, catch sabzi masala degi mirch powder green chili,baking powder and salt in a bowl and make lemon sized balls out of it. Deep fry the balls in medium hot oil till golden brown. drain on absorbent paper. Heat 2 tbsp oil in a pan or kadahi and crackle the cumin seeds then add finely chopped ginger,garlic,green chilies and onions and stir and continue to fry the masala paste till it starts leaving oil from the sides. Add tomato puree and all the spices and salt and cook further till the water evaporates. (At this stage you can add cashew paste if you like a thick gravy but I don't prefer to use it in this dish). Now add about 1.5 cup water to the paste. stir and simmer for 10-12 minutes. 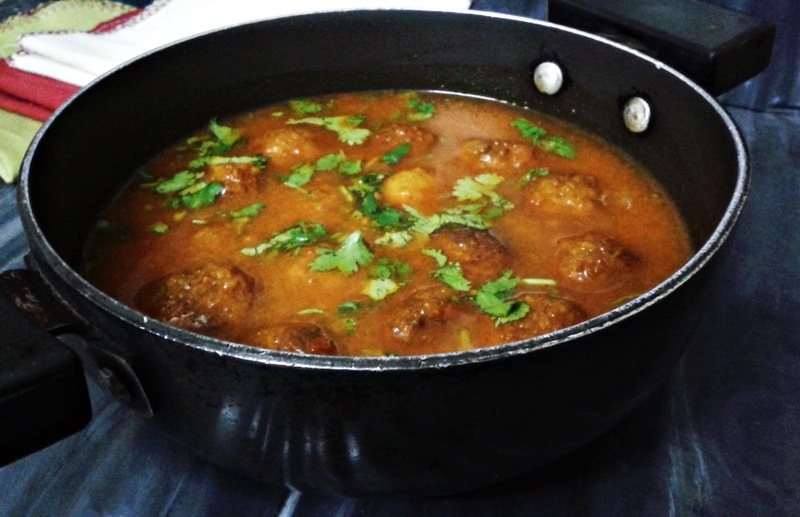 lastly add the fried lauki koftas and let them be in the lauki curry for a few minutes. Switch off the gas, garnish with coriander leaves and serve lauki kofta hot with rotis, naan or jeera rice.